As you can guess from the title, today is my dad’s birthday!!! 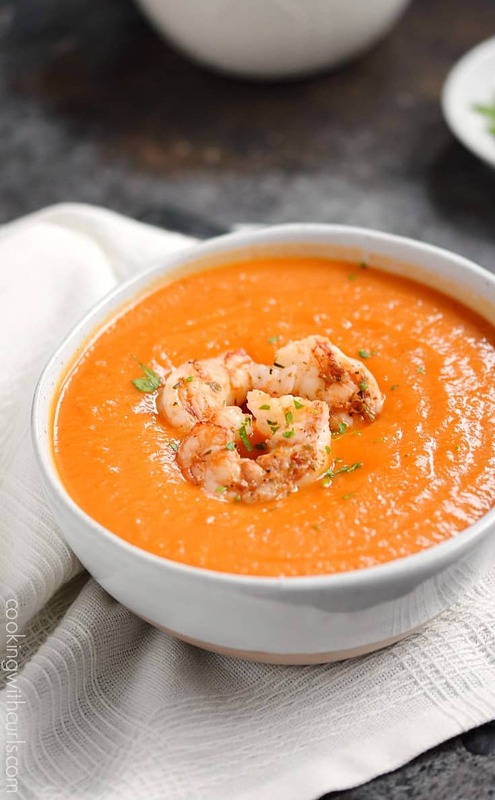 He lives far, far away so I will not be able to spend it with him 🙁 I do think he would really like this Roasted Red Pepper Soup with Grilled Shrimp, so I am posting it in honor of his special day….. When he has too much soup left over, he gives it away to the neighbors. I can just imagine him walking up and down the street with containers full of soup! One of the neighbors really enjoyed it and wanted her husband to try it sometime. So the next time my dad made that particular soup, he took it down to their house. He started chatting with the man and everything is going great until the man tells him that he doesn’t live there, he is house sitting for them! Oh…well then…welcome to the neighborhood 🙂 If you knew my dad, you would be laughing too! Preheat broiler and move top shelf to 6″ below heat. 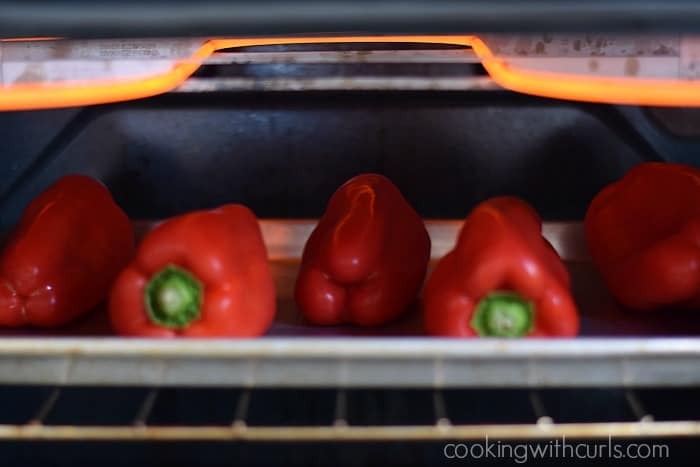 Clean bell peppers with veggie wash, and dry completely. Place on a baking sheet and rub with oil. Place in the oven and broil until all 4 sides are blackened 25 – 35 minutes…..
Place in a large bowl (or pyrex pan) and cover with plastic wrap for 20 minutes. The steam helps remove the skins…..
Rinse under warm water, and peel away the skins. 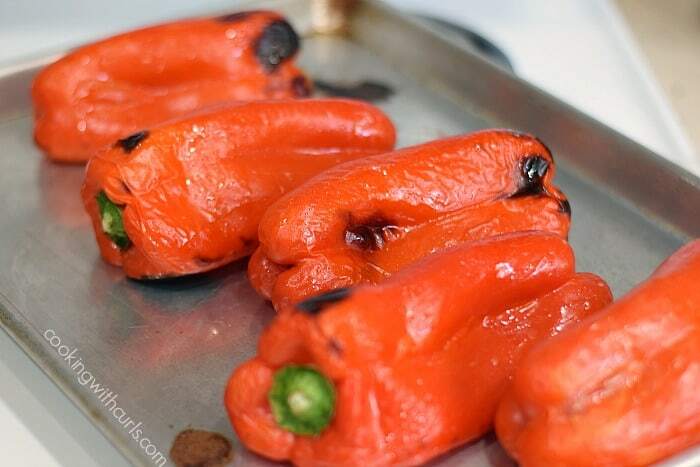 Remove the stem and all seeds…..
Chop roasted peppers, set aside. Heat 2 Tablespoons of olive oil in a large Dutch oven, add the onions. Cook for 1 minute. Add the garlic and cook for one additional minute…..
Add the carrots and potatoes, and cook for 3 more minutes…..
Add chicken broth, chopped peppers, and chili powder…..
Add cilantro. Bring to a boil, reduce heat and simmer partially covered until potato is very tender, about 30 minutes. Cool slightly, and blend soup until smooth with an immersion blender. 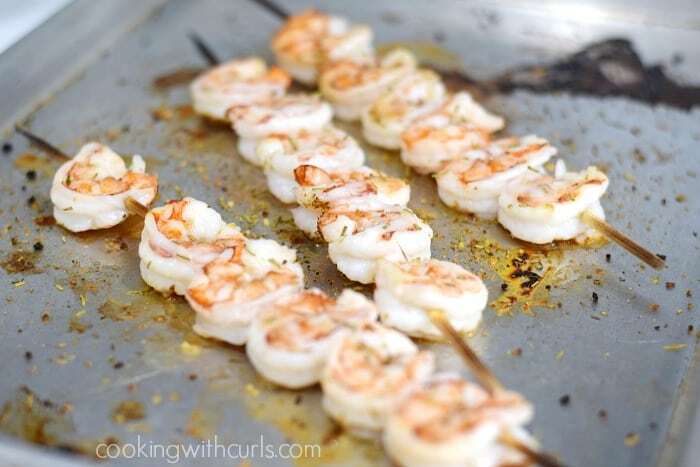 Skewer your shrimp, drizzle with oil, and season with garlic pepper. 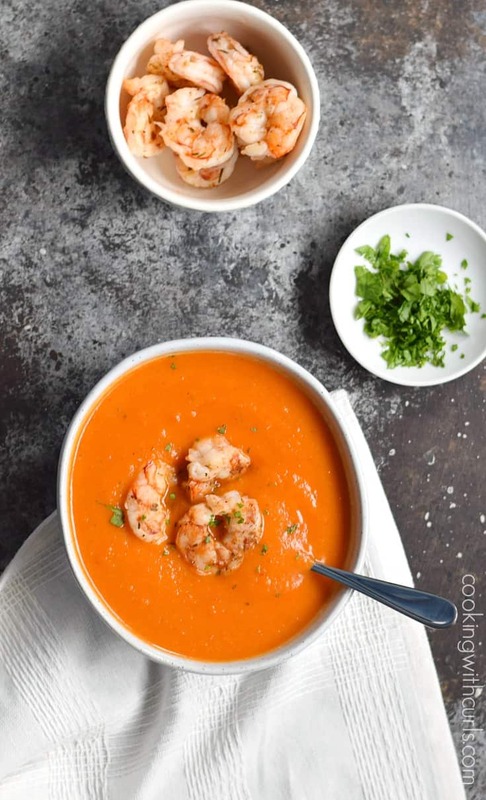 Place on a heated barbecue grill, or place under the broiler cooking until both sides turn pink…..
Pour soup into a bowl, place 3 or 4 shrimp in the center, garnish with cilantro and serve….. I absolutely LOVE this soup!! It is thick, creamy, and full of flavor…and it is healthy too! 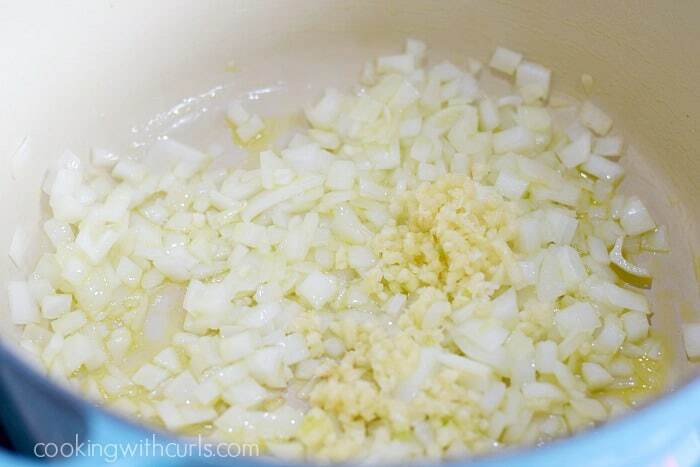 Instant Pot French Onion Soup – I gave up waiting for his recipe and created my own! 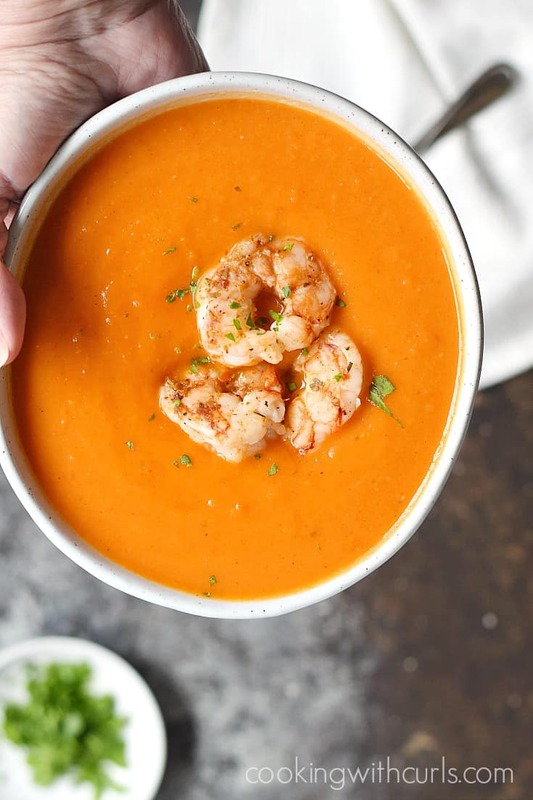 This Roasted Red Pepper Soup with Grilled Shrimp is thick, creamy, and the perfect way to warm up on cold winter days! Preheat broiler and move top shelf to 6" below heat. Clean bell peppers with veggie wash, and dry completely. 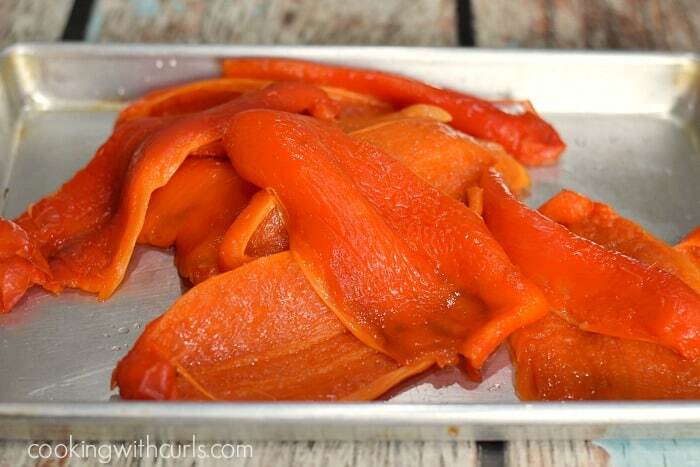 Place on a baking sheet and rub with oil. Place in the oven and broil until all 4 sides are blackened 25 - 35 minutes. 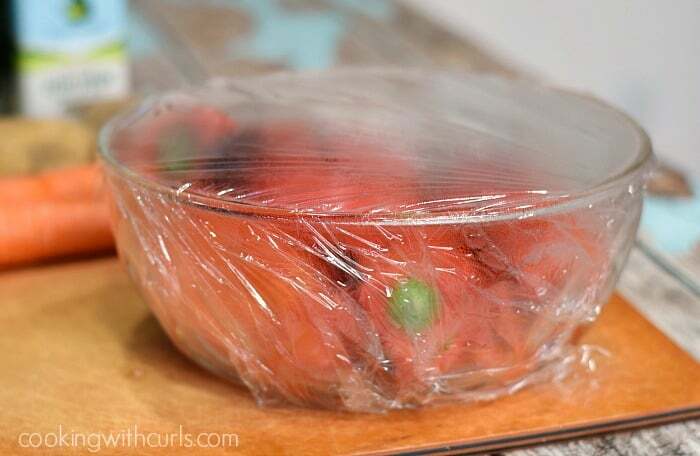 Remove from the oven, place in a large bowl (or pyrex pan) and cover with plastic wrap for 20 minutes. The steam helps remove the skins. Rinse under warm water, and peel away the skins. Remove the stem and all seeds. Heat 2 Tablespoons of olive oil in a large Dutch oven, add the onions. Cook for 1 minute. Add the garlic and cook for one additional minute. 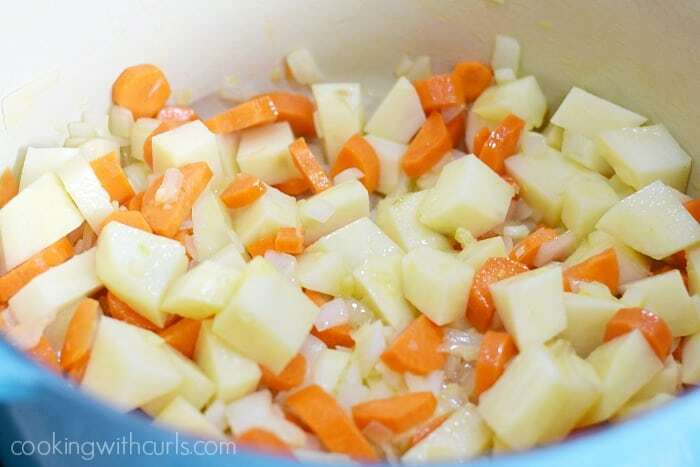 Add the carrots and potatoes, and cook for 3 more minutes. Add chicken broth, chopped peppers, chili powder, and cilantro. 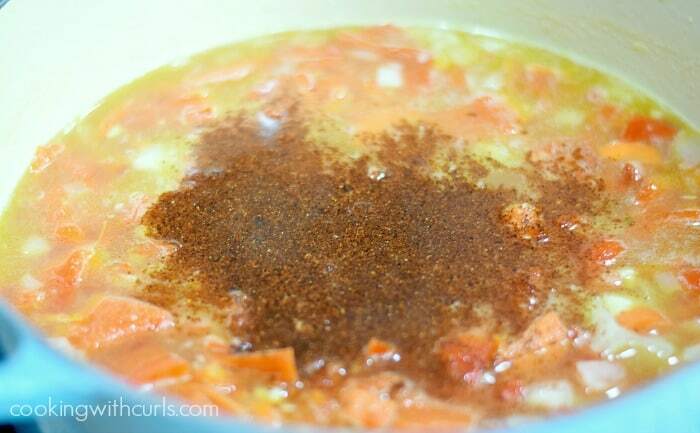 Bring to a boil, reduce heat and simmer partially covered until potato is very tender, about 30 minutes. Skewer your shrimp, drizzle with oil, and season with garlic pepper. Place on a heated barbecue grill, or place under the broiler cooking until both sides turn pink. Pour soup into a bowl, place 3 or 4 shrimp in the center, garnish with cilantro and serve. What a delicious soup! We would love for you to link it up with our Wednesday link party! I’m such a sucker for seafood! 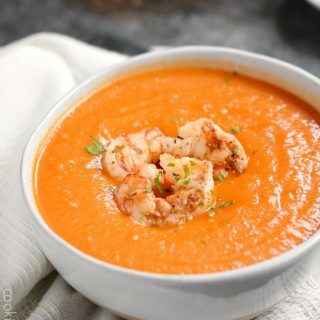 Love the idea of shrimp in soup. Happy bday to your dad! It looks soooo delicious!!!! Now I feel really hungry:) By the way, I have a little surprise for you on my blog-hope you like it!!! This looks good, Lisa! I love roasted red pepper soup. Love the shrimp addition! Pinned to my food board! This soup sounds fantastic. I love the addition of the grilled shrimp. Thanks for sharing on Thursdays Treasures. This soup will be one of my features. I was raised on the Alabama Gulf coast so I really love shrimp. Their are lots of shrimpers in that area. You soup look great! Thank you so much for stopping by Saturday Dishes and adding this recipe. I pinned it! Thanks for sharing at Saturday Dishes! Pinned this.